Club Penguin Cheats by Mimo777 Club Penguin Cheats by Mimo777: Igloo Decorating Contest Now Open! Even non members can enter the contest! lol Do you think mine will win? I can't wait to see all your awesome cool iggies! I realized that too!!!!! Thats soo cool. now i need to save up coins for decorating! Yes Mimo yours will definatly win *Trys not to laught*! Btw thanks for the credit =] I finally posted something on my site before you hehehe! Very cool! I am so excited to see the new furni catalog! :D I was a non member last year and I couldn't buy any awesome iggy stuff. MINE IS SICK, ITS GONNA POWN THE OTHER IGGIES LOL. How would a non member win? They have nothing in there igloo! I have an idea! CP should give a free furniture item to everyone! Hey mimo you should have a mimo dress up poll where you dress up in a bunch of different outfits and we vote for which one we like best. Hey mimo do you think we will see any famous penguins at the holloween party? I hope mine wins. But first, I got to wait for the new igloo stuff. Then I will submit it. Lol non members can enter! But where can you get the igloo decoratioins if you're a non-member? I just comented to you that i got bannded for a typo and said it was forever. Turns out, it was for 24 hours. Its still a ban, but not that bad of one. cool! 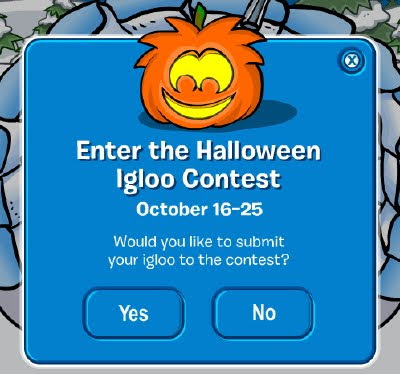 I bought the pumpkin igloo! lol! your right mimo non-members can submit to the contest :) i just might win 50,000 coins!! I hope bad submissions don't win again... one way or another, that phenomenon ALWAYS happens. How can non-members stand a chance of winning if we cant buy anything?? Unfortunately non-members can't get decorations. It's all part of club penguin's compulsive drive to get kids to buy memberships. (One of the reasons I think its great that mimo stays a non-member.) By the way nothing wrong with being a member I still am going to be like mimo and stick to a non-member. Fsdvfbgeee said... Will there be any famous penguins at the party? Possibly no one is sure! But last year Gary The Gadget Guy made an appearence (G) so mabye this year he will show up! i was runner up last year. My Igloo is sick!! I hope to win. Good luck to everyone who enters!